Cak & Ning Surabaya is a figure represent the youth of Surabaya who has the quality topreserve local culture and as a culture representative from Surabaya. 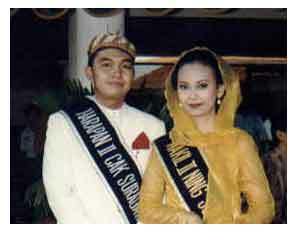 The original custom of Cak Surabaya contains of a hat called udeng with 3 (three) sides of black modang putih in the edge and a assimetric poncat. A kind of blaser with the accessories :watch,parikesit,rawon or gringsing wiron sarong and a kind of slippers from Surabaya. Ning Surabaya wearing anggul, lace kebaya and vail, pesisiran sarong and slippers. Earing, ankle bracelet (binggel), gold bracelet,pins,eyeliner and henna as the accessories.